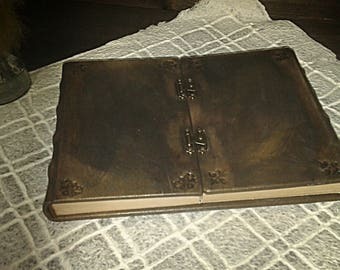 PRACTICAL MAGIC Great Double Book of Shadows - grimoire, genuine leather, reproduction of the book in the film "Practical Magic"
It is very beautiful :) I love it. This is more beautiful than I imagined. Great craftsmanship! The book is fairly nicely made to an average person's eyes, and with the modifications I got one exactly in the colors I wanted. However, I have to note that the delay in getting my order was absolutely ridiculous (it's April, I ordered mine in February), and the seller didn't contact me about it until I messaged them myself - there wasn't even a general shop notification of expected delays! To top it off after getting back to me they promised a general timeline for being finished but in the end took half again as long as that. The item may indeed be nice but do make sure you have absolutely no hurry with getting what you paid for. 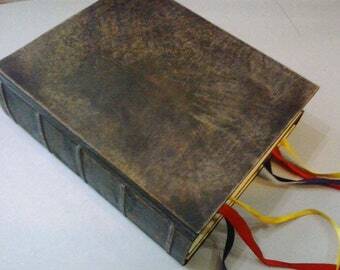 I'm a book restorator, I love my job, I put into my work all the passion and artistic inspiration, always look for new models. My products are made ​​with care and attention to detail. I am inspired by the Italian tradition, by vintage, by fashion, by design, by homedecor, and much more. I use first quality materials, the leather (calf, goat, sheep) is vegetable tanner and hand-dyed. Each journal is hand-sewn, I don't use ready made blocks. There is a right of return on our items. You must send us an email within 10 days from the reception of the product. The product must be returned intact and we will refund the amount paid (less the shipping cost). PLEASE TAKE NOTE: BECAUSE EACH JOURNAL IS MADE TO ORDER, ORDERS TYPICALLY TAKE ABOUT 7 DAYS TO PROCESS BEFORE SHIPPING. HOWEVER, I CAN USUALLY ARRANGE FOR YOUR JOURNAL TO BE DELIVERED BY A CERTAIN DATE IF NEEDED . JUST CONVO ME! If you have any questions regarding the item, payment or combined shipping please contact me and I will answer as quickly as possible.